This time I want to tell from different stages of Yasuchika´s life, namely illustrated by a selection of a few tsuba which show characters as motif. Yasuchika was born in the tenth year of Kanbun (寛文, 1670) as son of Tsuchiya Chûzaemon (土屋忠左衛門) who was a retainer of Dewa´s Shônai fief (庄内). His first name was „Yagohachi“ (弥五八) and with his coming of agem he entered the service of the Matsudaira-Naizen family (松平内膳), who were the elder (karô, 家老) of the Sakai family (酒井). The Sakai were the daimyô of the Shônai fief by the way. But on the side, he entered an apprenticeship as a kinkô artist with the local Shônai-Shôami artist Satô Chinkyū (佐藤珍久). When he realized that metalwork was his thing, he resigned from his bushi status, married the daughter of his master and became an independent kinkô. In the 16th year of Genroku (元禄, 1703) – he was 34 years old at that time – he left his wife and children under the care of his father-in-law and went to Edo to refine his craft under the guidance of Nara Tatsumasa (奈良辰政). This step might be connected to the fact that Chinkyû himself had studied under a Nara master, namely under Toshiharu (利治), who was in turn the master of Tatsumasa. According to transmission, Yasuchika lived at the house of a relative at that time, namely Tsuchiya Hanbei (土屋半兵衛), in Edo´s Kanda district. But the house fell victim of both fires in the 16th year of Genroku (1703) and in the second year of Hôei (宝永, 1705). So Yasuchika went to Shinano province for some years to work for the Suwa shrine (諏訪神社). But, by the latest with Hanbei´s death in Hōei four (1707), he had returned to Edo to continue his profession as a kinkô artist. Some time later he had to bear a serious blow when he learned in Edo of the death of his wife. He hadn´t been in Shônai for more than ten years by then. But he was able to take his mind off his worries by work when he was employed in the later years of the Shôtoku era (正徳, 1711-1716) by Matsudaira Daigaku no Kami Yorisada (松平大学頭頼貞, 1664-1744). Just about ten years earlier, to be more precise in Genroku 13 (1700), Yorisada had been transferred from the Nukada fief (額田藩) of Hitachi province to Moriyama (守山藩) in Mutsu province which had become officially an independent fief whith his entry. The fief was rather small and had an annual income of 20.000 koku. Well, Moriyama was actually regarded as a so-called “shihan” (支藩), a quasi “branch fief” of another fief ruled by a different line of the same family. In our case, the Matsudaira were as we know related to the Tokugawa. So Moriyama was under the supervision of the influental Mito fief. That means that the daimyô stayed permanently in the Edo mansion and was exempt from commuting between the latter and the fief in the course of the sankin-kôtai system. The Moriyama-Matsudaira mansion was located in the Ôtsuka district (大塚) of Edo and covered a 20,46 ha large area. As the wind was blowing up constantly from the lower southwestern districts of Edo, the mansion was also called Fukiage-tei (吹上邸, about “upward wind mansion”). 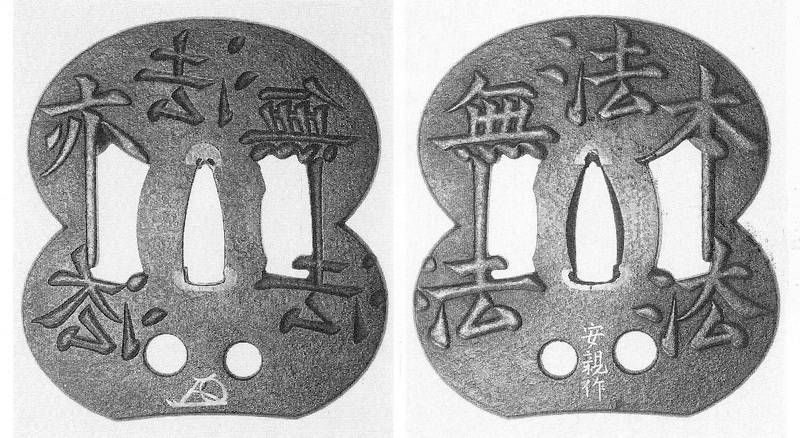 So Yasuchika worked from this mansion and this employment with Yorisada was very beneficial to Yasuchika´s artistic development and very individual pieces date back to that stage in his career, for example the peculiar daigaku tsuba shape named after Yorisada´s honorary title “Daigaku no Kami. 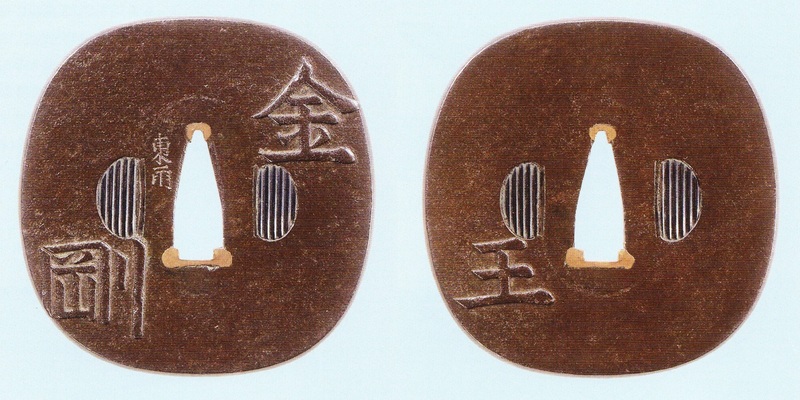 The two tsuba introduced below show such a daigaku-gata. And thus we arrive at the first two pieces through which I want to illustrate this stage in his life. The first tsuba is inspired by fencing philosophies and shows in sukidashi and sukisage-bori the well-known phrases “katsujinken” (活人剣) and „satsujintô“ (殺人刀), also pronounced as „katsuninken“ and „satsunintô“, i.e. the „life-giving sword“ and the „death-dealing sword“ respectively. Mostly the katsujiken-satsujintô phrase is used to describe the process of mastering the art of swordsmanship, i.e. to come to a point where you have the freedom to decide if to kill or not or if to use your sword just to kill others or help them by dealing with their „problems“. 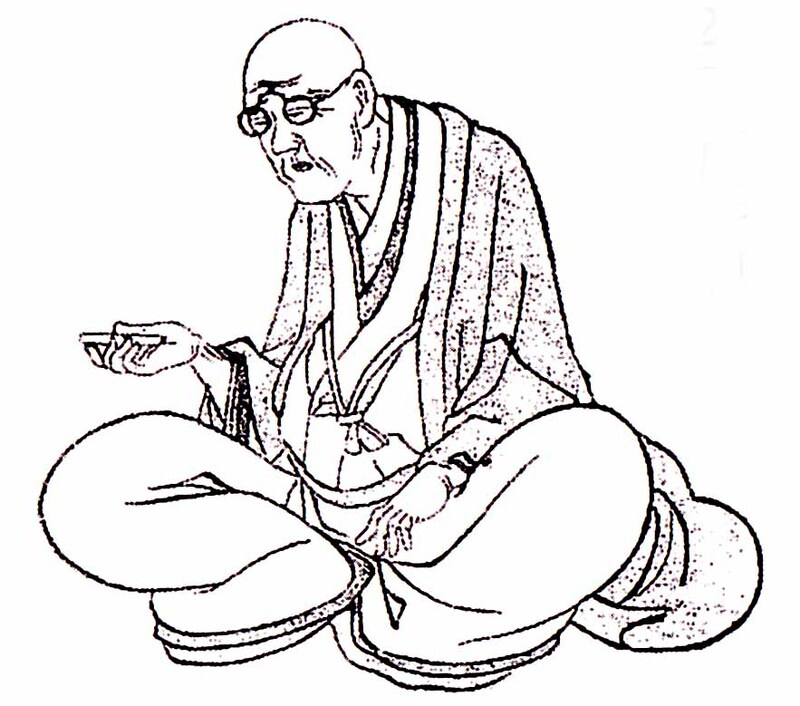 But the phrase has a much deeper meaning which goes back to „Mumonkan“ (無門関), the collection of Zen kôan compiled by the monk Mumon Ekai (無門慧開, 1183-1160). Chapter 11 is about the Zen master Jôshû Junshin (趙州従諗, 778-897) who visits two enlightened monks which already had retreated to their hermitages. According to the „Mumonkan“, he tested them by entering their cottages and asking „Anybody there?“ The monk raised his fist but Jôshû replied: „The water is too shallow to anchor here.“, what means about „there is not much enlightenment to find for me in here.“ But at the second monk and after the very same procedure, Jôshû replied after the monk had just raised his fist: „Free to give, free to take, free to kill, free to save,“ and made a deep bow. So Jôshû tested the mental states of enlightenment of the monks, that means if his reaction showed any hints of irritation by his question „Anybody there?“, Jôshû knew that this monk was not that deeply enlightened. But Mumon Ekai suggested on the other hand, that the monks were testing Jôshû. So they know that he was going to ask something like that and tested him by seeing his reaction after they just raised their hands. This situation is described as if two mirrors are reflecting each other. The goal of this kôan teaching is to go quasi once through the entire process of thinking into both Jôshû and the monks, followed by a transcending of all of this. And as it is common for the end of each chapter, Mumon forwards a little poem to this kôan which goes: „The eye like a shooting star, the spirit like a lightning; a death-dealing blade, a life-giving sword.“ In short, if you are truly enlightened, you can look through someones mind super fast and you have the power to either show him immediately that he is not enlightened, or help him with the right single word to get enlightened. Now to the next tsuba. This one shows again in sukidashi and sukisage-bori the characters (法本法無法・無法法亦法) which read: “hô wa moto hô to shite muhô nari, muhô mo hô to shite mata hô nari.” It basically means: “The laws of Buddha (Dharma) were initially not (profane/worldly) laws in the proper meaning of the word, but they eventually became laws (as they turned out to be “right”).” It is said that Shakyamuni Buddha told this his principle disciple Mahākāśyapa (Japanese „Makashô“ [摩訶迦葉] or „Daikashô“ [大迦葉]). Later many Buddhist reformers like Hônen (法然, 1133-121) and Nichiren (日蓮, 1222-1282) used this teaching of Shakyamuni to justify their reforms. 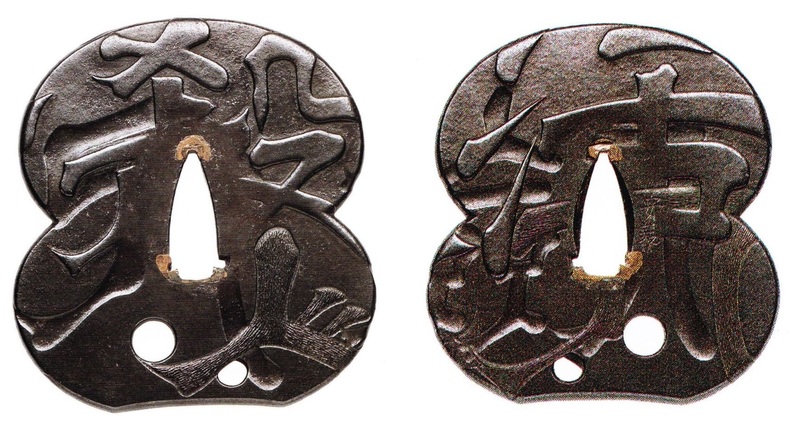 So the choice of phrases for these two tsuba made during the time he worked for Matsudaira Yorisada give us a deep insight into this employment relationship. It is namely assumed that the well-educated daimyô Yorisada initiated Yasuchika to certain classical subjects. As mentioned, this employment was very beneficial to Yasuchika´s artistic development, namely not only because of the fact that he got many orders and was able to refine his craft, but more of a philosophical nature. He got in touch with Buddhist teachings and history and probably struggled with Zen kôan himself. It is namely hardly conceivable to assume that he didn´t think about the meaning of the motif he was working on over days, weeks or even months. So maybe the tsuba with the katsujiken-satsujintô alludes to him testing Yorisada or to the other way round, or maybe they were likeminded on their way to enlightenment so that they experienced this mentioned „two mirrors reflecting each other“ situation. But let us continue with his career. Yasuchika quit namely voluntarily this employment to work even more independently. In the meanwhile, his son Yaichirô (弥一郎) was 22 years old and so he had him come to Edo. Yasuchika married again and moved to Kanda where he trained his students. At this time – pushed by orders of famous daimyô families like the Arima (有馬) and Tsugaru (津軽) – most of his famous jûyô-bunkazai and jûyô-bijutsuhin masterworks were created. That means he had attained artistic maturity by that time. In the 15th year of Kyôhô (享保, , 1730) he entered priesthood at the age of 61 and called himself henceforth „Tô´u“ (東雨, lit. “Eastern Rain”). He handed-over the management of the family and his name „Yasuchika“ as well as his first name „Yagohachi“ to his son Yaichirô. In Genbun three (元文, 1738) his second wife died and from extant letters to his kinkô colleague Watanabe Arichika (渡辺在哉), who worked in his homeland Shônai, we learn that Yasuchika often had to stay in bad due to his bad physical condition. And in these hard times, the last tsuba was made which I want to introduce representative for his latest years. It is as indicated no longer signed “Yasuchika” but “Tô´u” and shows on a very gentle nadekaku-gata, by making use of much free space, the three elegantly interpreted characters “Kongô´ô“ (金剛王). Kongô´ô can either be the abbreviation of „Kongô-yasha-myôô“ (金剛夜叉妙王, sanskrit „Vajrayakṣa“), one of the „Sixteen Great Bodhisattva“ and one of the „Five Great Myôô“, or of the Bodhisattva „Kongô-za´ô“ (金剛蔵王), one of the most important deities of the practitioners of shûgendô (修験道). So it is possible that Yasuchika increasingly turned towards Buddhism when he fell ill, namely as support for his prayers for health and inner peace, as spiritual backing for keeping-off demoniacal hindrances (mashô, 魔障) during meditation. The brush strokes are much more unobtrusive as on the two tsuba in daigaku-gata. Everything, i.e. the color, shape, and the arrangement and interpretation of the motif is much more cut back, a look which is so typical for the tsuba from his later Tô´u phase. Anyway, Yasuchika died six years after his second wife, namely on the 27th day of the ninth month of Enkyô one (延享, 1744), at the age of 75. I have a tsuka mounted on a ko-wakizachi which has a long crested heron walking over long stemmed grass with on the reverse has two kanji inscription whih I translated long time ago as Easter Rain, these are followed by a kao . I was none the more enlighted until last night when I stumbled on your article which made me think that this smallish tsuba may be by Yasuchka. If you so which I will take photos and forward them to you. Anyway thanks for educating me.